Our Price: $39.95 ( 72% OFF ) *Spring Sale! Polycarbonate prescription Rx light-weight hard-coated lenses (index = 1.59). Note, polycarbonate lenses are superior to regular plastic (CR-39) lenses (lighter & stronger). These lenses are industry standard for quality eyewear and a must for all children's glasses, because they are shatter-proof (ANSI standard for protection). Every job is completed and verified by licensed opticians at our USA lab. Compared to: $139.95 retail. Don't forget anti-reflection (AR) coating treatment for extra clear lenses...just add to Cart before Check-out. *Pricing is for most standard frames (extra large or rimless frames may incur added charge). For prescriptions greater than - 6.00 or +2.00, or high cylinder greater than +/- 2.00 (add-on charge may apply). We recommend one of the hi-index options. I just received my order and I just want to let you know that I am so happy with my purchase and my glasses! Thank you so so much for the amazing customer service and work! I just wanted you to know that I received my glasses back and they are perfect! Thank you for your assistance and for making my experience an enjoyable one. I'll definitely order again in the very near future. I got them and love them! Thanks, I'll be ordering again. Thank you very much for my glasses. You guys did an awesome job!!! 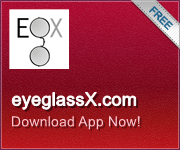 I will be doing business with eyeglassX again. I recommend this product.